Why I read this book: Two of the people I work with independently recommended that I read it... actually listen to it. I never was a big SNL fan. Not really anyway. But the years that had all of those strong women, including Tina Fey, had me tuning in quite a bit. When she did the whole Sarah Palin thing before the last presidential election, I was tuning more. I enjoyed Mean Girls and whenever I see 30 Rock, I end up stopping to watch. Thus, when I heard Tina Fey had wrote a memoir, I was all over that. I heard about it from someone at work who told me to get the Audiobook because Tina reads it. I am glad I did. It was quite entertaining to listen to her emote the way that I am assuming she wrote it. Tina covers a wide array of times in her life: from growing up not-blonde to being in crazy college situations to being a mom. I absolutely loved when she talked about how she learned about what it meant to be a women and that the most substantial of her information came from Tampon commercials. I loved hearing about her time at SNL and how she developed 30 Rock. So many interesting tidbits. They really made my commute so much more interesting! I could sit here and quote pretty much this whole thing to you, but the summary of it is, Ms Fey has lived quite a life and has quite a bit of words of wisdom. She coveys these words to us in a fun and entertaining way. 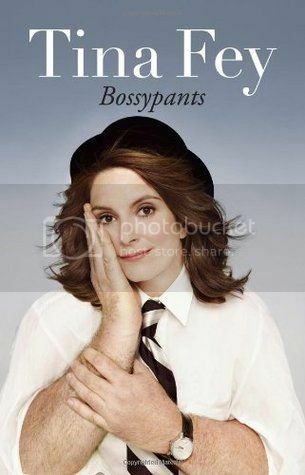 The Goodreads College Group is reading Bossypants for the month of August! So hop on over and check it out! (We are also reading Across the Universe which you will remember from our author interview). PS: This cover freaks me out. Another plus for the audio book version! The cover creeps me out too. But I've heard great things about it. I've been waiting for a library to get the e-book version of it (so don't have to see the cover), but maybe I'll try the audio book version. The audiobook is awesome- it's Liz Lemon reading it to you! I thought having Fey read it brought it more to life than simply reading it. I am really wigged out by the cover too. I really want to listen to this though, a coworker of mine did and said it was awesome. Glad you agree! Timely post because i just finished listening to the audio version yesterday myself. I actually was hoping for more substance, but I enjoyed what she presented very much. Glad you all liked it or are thinking about reading it. I thought it may be more, but I wasn't expecting really much of anything when I started except to be entertained. So anything after that was a bonus. I read the book right around Mother's Day...it was hanging around the house for a while and my children were fascinated by the odd cover...then one day when we were at Target, my daughter, 5, saw it on an endcap display and said, "Look mom, there's the book by the man with the lady face!" No matter how hard I tried I couldn't convince her it was a lady with man arms. Go figure. Still...awesome book. I have also requested the audio version because I have such good things about it. I read the print version, but I could hear Tina Fey in my head in the way I thought she would be saying it if that makes sense. It made me laugh out loud and was really an enjoyable and humorous read!